Over the last three-and-a-half decades, progress in reducing poverty has been painfully slow despite significant gains in economic productivity and average incomes. During the same time period, the inflation-adjusted wages of most low- and middle-income households have been essentially stagnant, which is the root cause of rising income inequality. A primary objective of the Economic Policy Institute’s Raising America’s Pay initiative is to expose the roots of growing inequality and demonstrate inequality’s real, adverse effects on low- and middle-income households (Bivens et al. 2014). In this paper, we explore how wage stagnation and growing inequality have undermined progress in reducing poverty. Between 1979 and 2013, hourly wage growth stagnated for the vast majority—even while those at the bottom relied increasingly heavily on their wages to make ends meet. At the same time, the vast majority of annual earnings increases for the bottom fifth were due to increasing work hours, not rising hourly wages. Income inequality over this period also increased—largely due to stagnant wages for low- and middle-income households—and became the single most important factor in the increase in poverty. To show the significance of wage growth in reducing poverty, we simulate what would have happened to poverty rates had we experienced broad-based wage growth from 1979 to 2013. We first examine the effects on poverty had wage inequality not increased since 1979 (i.e., had everyone’s wages grown at the same rate as average wages). Next we examine how the poverty rate would have been lower had economic gains been broadly shared (i.e., had all wages grown at the same rate as economy-wide productivity). Both simulations show that we could achieve real gains in poverty reduction by ensuring that lower-income workers are able to share in our country’s economic growth. And even these projected gains likely understate the extent to which a full-employment economy could alleviate poverty, as it would disproportionately benefit low-wage workers. Had wages grown in tandem with productivity over 1979–2013 and if the economy were at full employment, the non-elderly market-based poverty rate (i.e., the poverty rate for Americans under age 65 before safety-net supports are taken into account) would be 4.2 percentage points lower. This means that 11.2 million fewer people would be in poverty. These simulations show that increasing inequality, stagnant wages, and chronic shortfalls in labor demand have come at a serious cost to poverty-reduction efforts. Indeed, the economy’s failure to deliver gains to low-wage workers in recent decades means that the tax-and-transfer system is responsible for all of the progress made in poverty reduction since 1967. To boost the pace of poverty reduction going forward, fiscal transfers that help low-income families almost surely need to be accompanied by policies to foster widely shared wage growth. 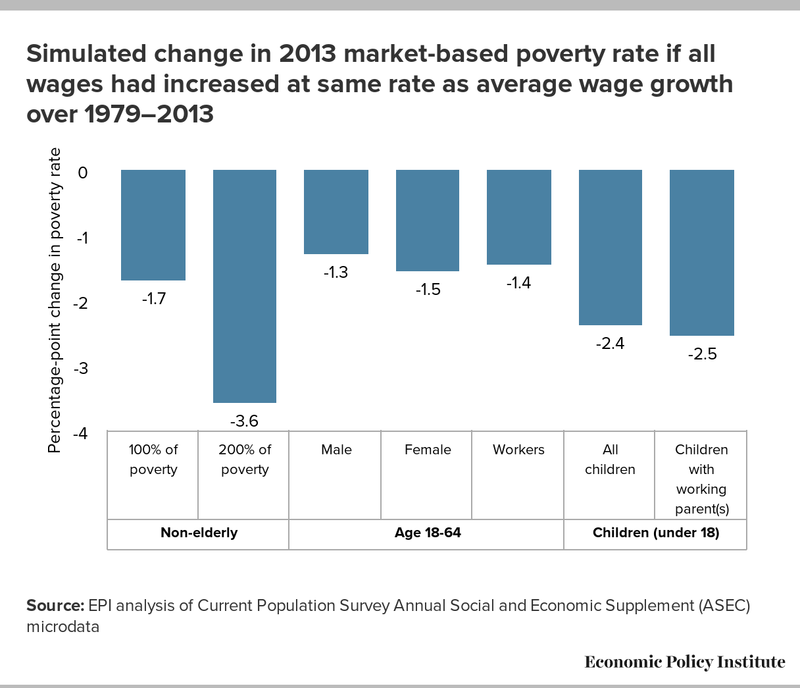 In fact, the simulated 4.2 percentage-point poverty-rate decline from using full employment and broad-based wage growth to reduce poverty is more than half as large as the poverty reduction from our entire range of anti-poverty programs. Without wage gains, the tax-and-transfer system needs to work harder every year simply to keep poverty rates from increasing. We argue that a policy agenda to fight poverty must include an agenda to raise wages. This agenda should include raising the minimum wage, setting a new overtime threshold, eliminating wage theft, strengthening workers’ collective bargaining rights, and targeting full employment. Increasing income inequality is the most important factor in determining changes in poverty since 1979, outweighing other factors such as family structure and racial identity. Growing economic inequality has largely severed the link between poverty reduction and overall economic growth that prevailed before the mid-1970s. If poverty reduction and economic growth were correlated as tightly as they were between 1959 and 1973, growth would have driven the poverty rate, which grew from 11.7 percent in 1979 to 14.5 percent in 2013, to essentially zero by now. Wage growth is a key to poverty reduction. The bottom fifth of non-elderly American households have increasingly relied on wages and work-related income (wages, benefits, and wage-based tax credits), which were more than two-thirds (68.3 percent) of their total incomes in 2011. Almost two-thirds of employable poor people work, and over 40 percent work full time. To counter growing wage stagnation and income inequality, intentional policy efforts to boost wage growth must accompany continued (or even deepened) efforts through the tax-and-transfer system to fight poverty. Progress in reducing poverty over the last three-and-a-half decades has been wholly due to an improved social safety net and in spite of the deterioration of wages earned by low-income households. Non-elderly market-based poverty (which includes just wage and capital income, thereby excluding the effects of taxes and transfers) was 19.5 percent in 2013. After government intervention, the overall non-elderly poverty rate stood at 12.1 percent, meaning the tax-and-transfer system decreased poverty by 7.4 percentage points. If increasing inequality continues to go unchecked, the tax-and-transfer system will have to work even harder to overcome increasing wage inequities. If all wages had grown at the same rate as average wages since 1979 (in other words, had wage inequality not increased), the market-based non-elderly poverty rate would be 1.7 percentage points (or 8.6 percent) lower today, and 4.5 million fewer people would be poor. If all wages had grown at the same rate as productivity since 1979 (in other words, had economic gains been more widely shared with low- and moderate-wage workers), the market-based non-elderly poverty rate would be 2.6 percentage points (or 13.5 percent) lower today, and 7.1 million fewer people would be poor. If low-wage workers were working as many annual hours as they would if the economy were nearer full employment, the effects of broad-based wage growth would be more pronounced. Combined with increasing wages at the same rate as economy-wide productivity growth, full employment would reduce the non-elderly market-based poverty rate by 4.2 percentage points and bring 11.2 million people out of poverty. The child poverty rate would be 5.9 percentage points lower, and 4.4 million fewer children would be in poverty. The poverty rates for black and Hispanic individuals age 18–64 would decline by 5.4 percentage points (1.3 million people) and 6.7 percentage points (2.2 million people), respectively. However vital the tax-and-transfer system is to supporting low-income households, policy tools that spur wage growth are also needed. If we were to see broad-based wage growth consistent with increases in productivity and on par with a full-employment economy, the resulting impact on poverty reduction would be more than half as large as that of our entire range of current anti-poverty programs. The policy agenda to combat poverty through wage growth includes the same solutions that raise wages for all workers. To reverse the trends of elevated poverty, stagnating wages, and increasing inequality, we must strive for a full-employment economy through public investment and worker-based Federal Reserve decisions. We must also make policy choices that give greater power and protections to workers, such as raising the minimum wage, increasing the overtime threshold, and eliminating wage theft. The poverty rate is the share of people in families whose incomes fall below the official poverty line, which is an income threshold set at approximately three times a basic family food budget, adjusted by family size and composition. For example, in 2013, the official poverty line was $23,624 for a two-parent, two-child family; $12,119 for a single individual under 65; and $18,769 for a single parent with two kids. In 2013, the share of the population whose incomes fell below these various thresholds was 14.5 percent. Over the past 35 years, progress in reducing the poverty rate has been severely hampered by stagnating wages and the resulting increase in income inequality. 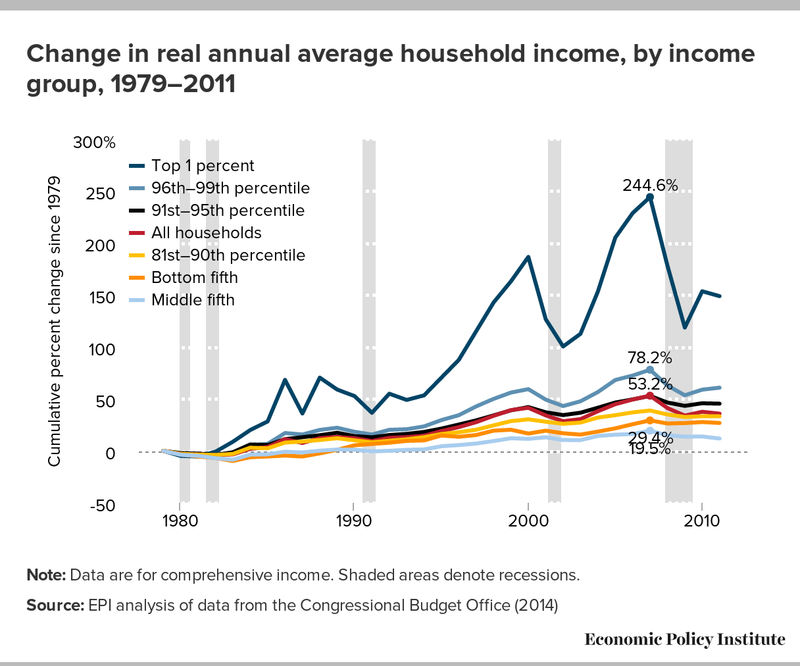 Figure A shows the increase in American income inequality since 1979. It charts the cumulative percentage increase in average incomes for all households (i.e., the overall average); the bottom and middle income fifths; households between the 81st and 90th percentiles, 91st and 95th percentiles, and 96th and 99th percentiles; and the top 1 percent. Note: Data are for comprehensive income. Shaded areas denote recessions. Although the figure depicts trends over 1979–2011, the main focus should be on the 1979–2007 period, as this span best shows the underlying trends toward greater inequality, and income trends between 2007 and 2011 were driven by the Great Recession and the extremely slow recovery.1 The shift in the distribution of income over the 1979–2007 period is striking. Average incomes grew by 53.2 percent. Incomes of the bottom fifth of households grew by 29.4 percent, and incomes of the middle fifth grew just 19.5 percent. Even more striking, income growth of households between the 81st and 90th percentiles (38.9 percent) did not come particularly close to matching overall average income growth rates, and even average income growth of households between the 91st and 95th percentiles (53.0 percent) fell just short of average growth. In contrast, income growth of households between the 96th and 99th percentiles (78.2 percent) significantly exceeded average growth. And income growth of the top 1 percent (244.6 percent) was nearly five times as rapid as overall average growth. In short, over 90 percent of American households saw below-average income growth over 1979–2007. This is because the dramatic growth of top 1 percent incomes pulled up average income growth. Figure B illustrates the stakes of rising inequality by showing how it has delinked economic growth and poverty reduction. Before the mid-1970s, economic growth was associated with significant poverty reductions, but since the 1970s, aggregate growth has not correlated with lower poverty rates. The figure compares the actual poverty rate with a simulated poverty rate based on a model of the statistical relationship between growth in per capita gross domestic product (GDP) and poverty that prevailed between 1959 and 1973. Since then, the actual poverty rate stopped falling and has instead fluctuated cyclically within 4 percentage points above its trough in 1973. * Simulated poverty rate is based on a model of the statistical relationship between growth in per capita GDP and poverty that prevailed between 1959 and 1973. However, if the relationship between per capita GDP growth and poverty that prevailed from 1959 to 1973 (wherein poverty dropped as the country, on average, got richer) had continued to hold, the poverty rate would have fallen to zero in the mid-1980s. In other words, broadly shared prosperity could have led to a near eradication of poverty in the United States. Instead, over the last four decades prosperity has been increasingly funneled toward the top. Many would not know it from following the policy discussion on poverty, but income inequality has been a far larger driver of poverty changes since 1979 than many other influences that loom larger in the public debate. Several commentators point to factors such as family structure, racial identity, or educational attainment as drivers of poverty. It is true that women, people of color, and single mothers do experience disproportionately higher levels of poverty. This is shown in Table 1, which compares the share of the population in poverty by age, gender, race, and family composition with those groups’ share of the total population. At first glance, it would seem that family structure and racial identity are therefore significant determinants of changes in poverty, as these groups account for a disproportionately high number of people in poverty. However, over the last three-and-a-half decades, it was not growth in the population of single mothers or of certain racial groups that drove poverty. When these demographic factors are compared with the effect of income inequality on poverty levels since 1979, inequality dwarfs them all. 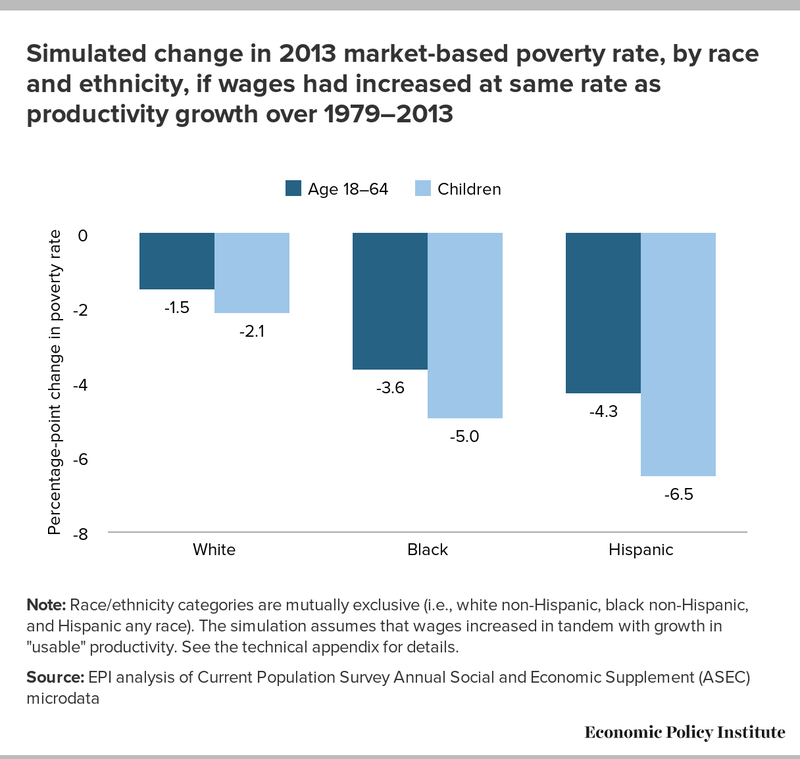 This is illustrated in Figure C, which examines a set of factors commonly associated with changes in poverty over the past three-and-a-half decades: changes in the U.S. population’s racial composition, education levels, and family structure, as well as overall income growth and income inequality. The figure shows how much (in percentage points) each factor contributed to the change in the poverty rate from 1979 to 2013. Over this period, educational upgrading (workers gaining more education) and overall income growth were the two biggest poverty-reducing factors, while growing income inequality was the largest poverty-increasing factor. While overall growth and education were working to bring the poverty rate down by a combined 6.3 percentage points, growing inequality more than negated the effects of these poverty-reducing factors, pushing up the poverty rate by 7.1 percentage points. In other words, the poverty rate was 7.1 percentage points higher in 2013 than it would have been had inequality not increased since 1979. This relates to the data presented in Figure B, which showed that if inequality had not increased, poverty would have been eradicated in the mid-1980s. Instead, poverty actually increased by 2.8 percentage points over 1979–2013, with inequality as the largest reason for this increase, eclipsing the benefits gained from a growing economy and more educated workforce combined. Relative to growing income inequality, the changing racial composition of the U.S. population over this period (the growth of nonwhite populations with higher incidences of poverty due to systemic factors such as segregation, discrimination, and historical inequities) and changes in family structure (the growth of single-mother households) have contributed much less to increasing poverty, particularly in recent years. In fact, between 1979 and 2013, the role of income inequality in increasing poverty was over four times more important than changes in family structure (7.1 percentage points versus 1.6 percentage points). 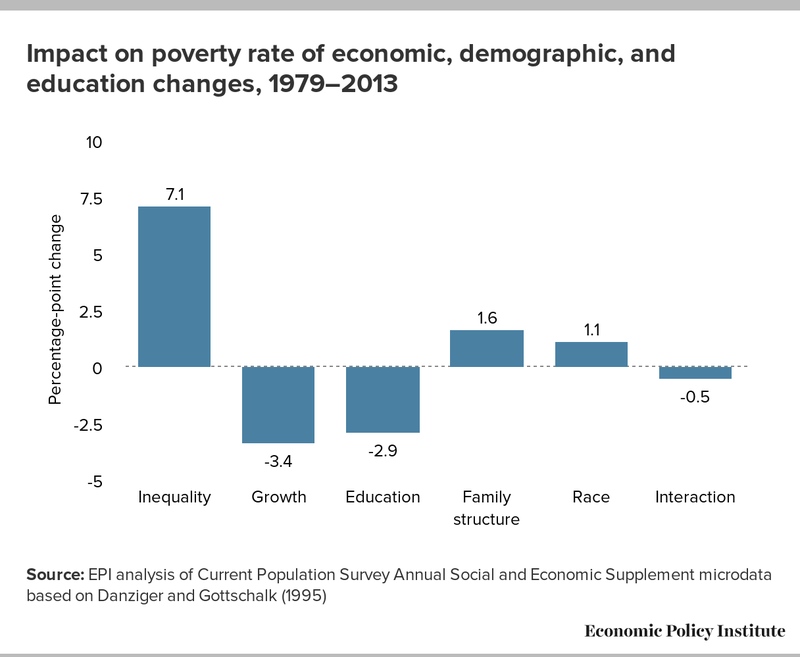 Incidentally, although these characteristics of the workforce, such as family structure, racial identity, and educational attainment, are often mentioned in policy debates concerning poverty, when taken together their net effect on poverty since 1979 is effectively zero. In recent decades, wages, employer-provided benefits, and tax credits that are dependent on work have become increasingly important to incomes of the bottom fifth of households. Moreover, because a significant share of the poor work and work full-time, boosting employment and wages can be an important tool for reducing poverty. The rise of income inequality and the stalled progress in reducing poverty since 1979 are closely tied to stagnant wages for the vast majority. Over the same time period, wages and wage-related safety-net income (from such sources as the earned income tax credit, or EITC) have grown in importance to low-income households. 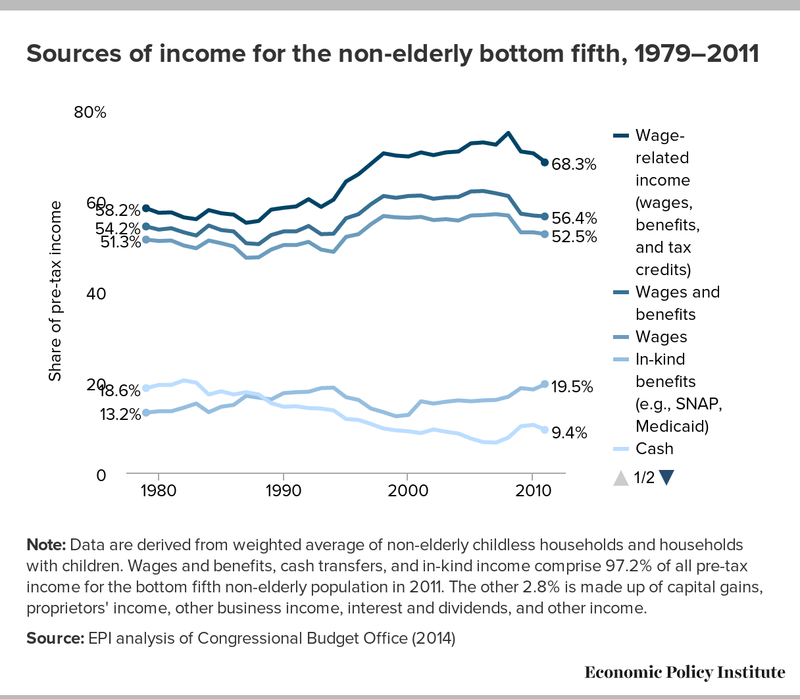 Figure D displays the major sources of income for non-elderly households in the bottom fifth of the income distribution from 1979 to 2011, using the CBO’s measure of comprehensive income. It shows that incomes of the bottom fifth are increasingly dependent on ties to the workforce. Wages, employer-provided benefits, and tax credits that are dependent on work (such as the EITC) made up 68.3 percent of non-elderly bottom-fifth incomes in 2011, compared with only 58.2 percent in 1979. While government in-kind benefits from sources such as the Supplemental Nutrition Assistance Program (i.e., food stamps) and Medicaid increased from 13.2 percent of these bottom-fifth incomes in 1979 to 19.5 percent in 2011, cash transfers such as welfare payments have declined 9.2 percentage points (from 18.6 percent to 9.4 percent). Note: Data are derived from weighted average of non-elderly childless households and households with children. Wages and benefits, cash transfers, and in-kind income comprise 97.2% of all pre-tax income for the bottom fifth non-elderly population in 2011. The other 2.8% is made up of capital gains, proprietors' income, other business income, interest and dividends, and other income. Many efforts to boost living standards for the bottom fifth often focus intensely on the design of public transfers and tax credits. For better or worse, the safety-net system has clearly become increasingly tied to work through programs such as the EITC and the child tax credit, which only benefit households with labor earnings. While other transfers and tax credits are clearly important to families in the bottom fifth, it is crucial to recognize that this group depends on pay from the labor market for the majority of their income. However, the rise in the importance of labor earnings and work-related transfers to incomes in the bottom fifth has unfortunately not been the result of rising hourly wages. Instead, it has been driven by increasing hours of work. 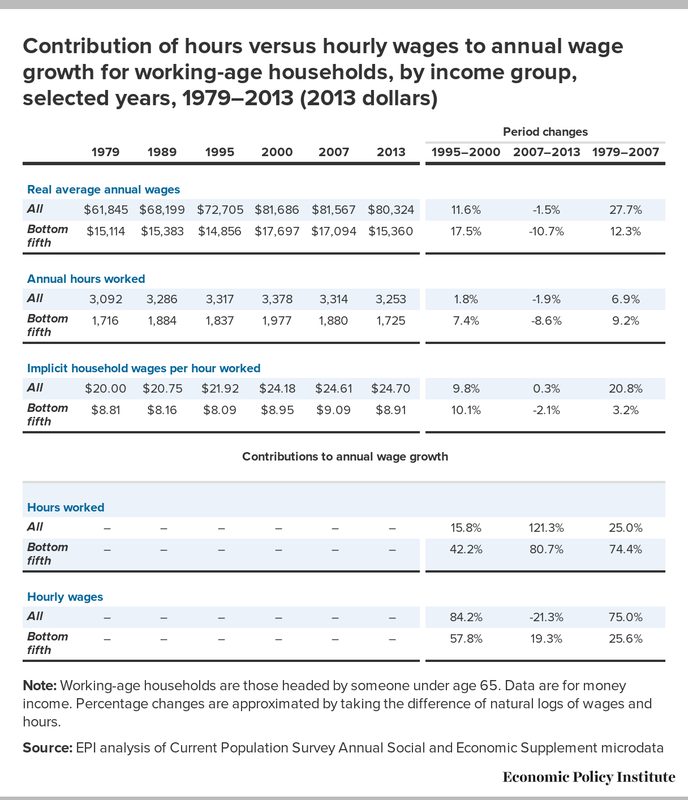 As Table 2 shows, annual earnings among working-age households in the bottom fifth grew a modest 12.3 percent from 1979 to 2007, rising from $15,114 to $17,094. (We look at 1979–2007 in order to see the longer-term trend, taking out the effects of the Great Recession and slow recovery.) However, the bulk of the improvement (nearly three-fourths) was due to more work (increased annual hours of work), while only a small part of the improvement (one-fourth) was due to higher earnings per hour worked (rising hourly wages). This means there was very little growth in hourly earnings of low-wage workers between 1979 and 2007. Between 1979 and 2007, annual hours worked by the bottom fifth of working-age households rose by 165 hours, while (inflation-adjusted) average hourly wages of the bottom fifth rose by $0.28. As shown in Table 2, the late 1990s was the only period of sustained hourly wage growth over the last four decades. Outside of this period, wages were either stagnant or fell for low-wage workers. This can be seen by comparing the actual 1979–2007 outcomes with those that would have prevailed had the late 1990s boom not occurred. Without the late 1990s, annual hours of bottom-fifth workers still would have increased, though only by 24 rather than 165 hours. In contrast, hourly wages of the bottom fifth would have actually fallen by $0.58. In short, over the last three-and-a-half decades, work and work supports have played an increasingly prominent role in incomes for those at the bottom. At the same time, the vast majority of income gains for this group are due to increasing hours, not rising hourly wages. Low-wage workers have clearly been holding up their end of the social contract, but their efforts have not been rewarded with rising hourly pay. Advocates on both ends of the political spectrum too often make the assumption that poor people are impoverished simply because they do not work. However, a significant share of the poor work and work full time, which means policies that boost employment and wages can be an important tool for reducing poverty. Figure E shows the population in poverty segmented into various labor status categories. The first column shows that 35.2 percent of the poor age 18–64 in 2013 were considered “not employable,” which means they are unable to work because they are retired, going to school, or disabled. 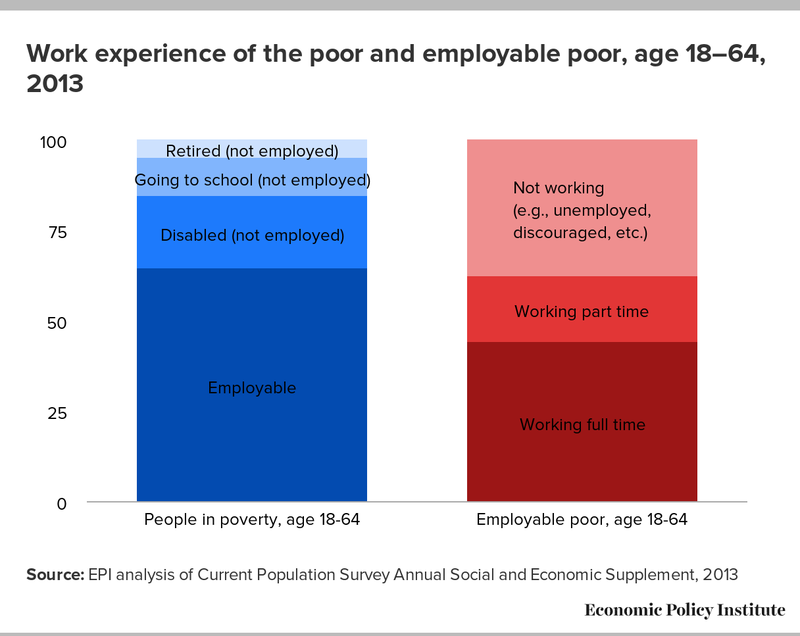 The other 64.8 percent of the working-age poor are “employable.” The second column shows us that among those working-age poor who are employable, 62.6 percent are working, and 44.3 percent are working full time. Of the employable working-age poor, 37.4 percent are not working, a share that includes the 3.3 million unemployed poor people who are currently seeking a job. The working-age employable poor are also, on average, clocking significant numbers of work hours. Table 3 examines average annual hours worked by the total employable population and the employable poor population in select years from 1979 to 2013. In 2013, employable people in poverty were working, on average, 737 hours per year. This is a decrease from 2000, when they were working an average of 872 hours per year. Although the poor population’s average annual hours are less than those of the total population, Table 3 shows that they follow the same general trends as the total population’s hours, yet are much more sensitive to cyclical ups and downs in the economy. During the period of strong economic growth over 1995–2000, when the unemployment rate fell below 4 percent, the poor population’s average annual hours increased by 11.9 percent, compared with a 3.9 percent increase for the total population. Conversely, during the 2007–2013 period of the Great Recession and recovery, the poor population’s hours decreased by 10.8 percent, while the total population’s average annual hours decreased by only 4.1 percent. This variability in average work hours shows that the nature of the business cycle disproportionately affects the employment of poor people. During periods of strong economic growth with higher employment rates, poor people gained work hours at a faster rate than the total population. In bad economic times, poor people and others who are “at the margins” of society and the labor market may be more likely to lose their job or have their work hours reduced. This is related to how different people cycle in and out of poverty over time, for various reasons that include the ability to acquire a job or receive enough scheduled work hours. For example, in 2008 and 2009, although the poverty rate averaged 13.8 percent, about one-third of the population fell below the poverty line for at least one month over that two-year period, while only 4.6 percent were in poverty the entire two years (Mishel et al. 2012). Therefore a weak or tight labor market will not only have a strong effect on the 14.5 percent of people defined as poor, but also on a much larger share of the population. Figure F shows a similar effect by presenting estimates of the impact on real wage growth of a 1 percentage-point decline in the unemployment rate (based on data for 1979 to 2007) across the wage distribution. It demonstrates how wages at the low end are the most sensitive to a strong (or weak) labor market. 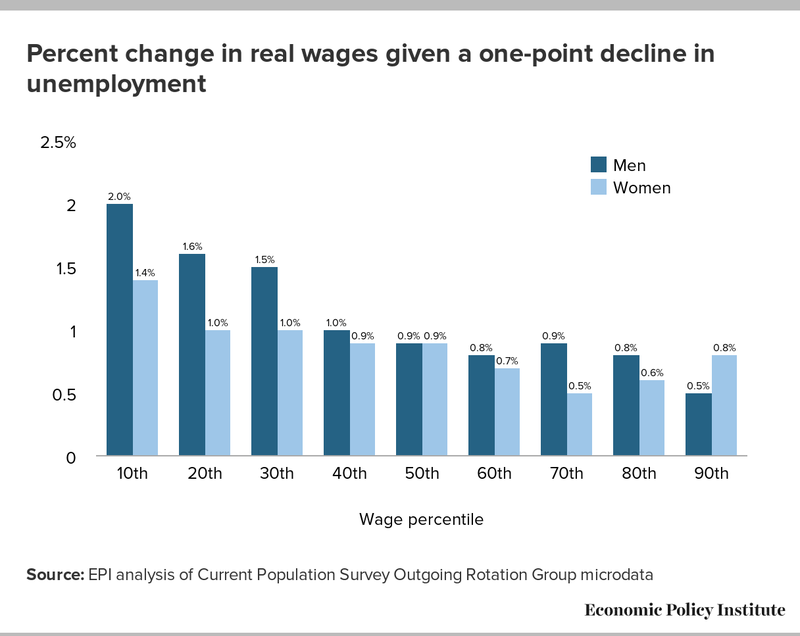 Note the steep downward “staircase” in the figure, as the percent change in wages falls for nearly every consecutive wage percentile up the scale, particularly for men; clearly, men at the lower end get the biggest wage boost from tighter job markets. For instance, for men at the 20th percentile, a 1 percentage-point decline in the unemployment rate is associated with a 1.6 percent increase in wages. According to these results, wage gains from lower unemployment are roughly twice as large for the lowest-wage male workers as they are for middle- and high-wage workers. Because of this, targeting low unemployment rates is disproportionately important for those with lower wages. Looking back at Table 3, we see a similar trend in annual hours of the working-age poor for those groups traditionally considered marginalized. Employable poor high school graduates saw an increase in work hours of 13.6 percent during 1995–2000, and a decrease of 14.6 percent over 2007–2013. Prior to 2000, the average annual hours worked by people of color who are employable and in poverty, namely blacks and Hispanics, fluctuated more than those of whites. However, since 2000, hours worked by whites have fallen by 20.1 percent, versus 17.0 for blacks and 3.2 percent for Hispanics. Most of the decline in hours for whites took place between 2000 and 2007 though, while blacks saw the greatest decline (16.1 percent) between 2007 and 2013. A return to labor market conditions closer to those that prevailed during the late 1990s and early 2000s would provide workers across demographic groups with a higher chance of becoming employed, or of gaining more hours in their jobs. These dramatic changes in work hours over business cycles are evident in Figure G, which displays stark disparities in poverty rates by race and ethnicity. As compared with whites, the poverty rate is nearly three times higher for African Americans and more than twice as high for Hispanics. While whites have lower poverty rates, their relatively flat poverty trend line conceals the fact that their poverty rate also rises and falls with business cycles. 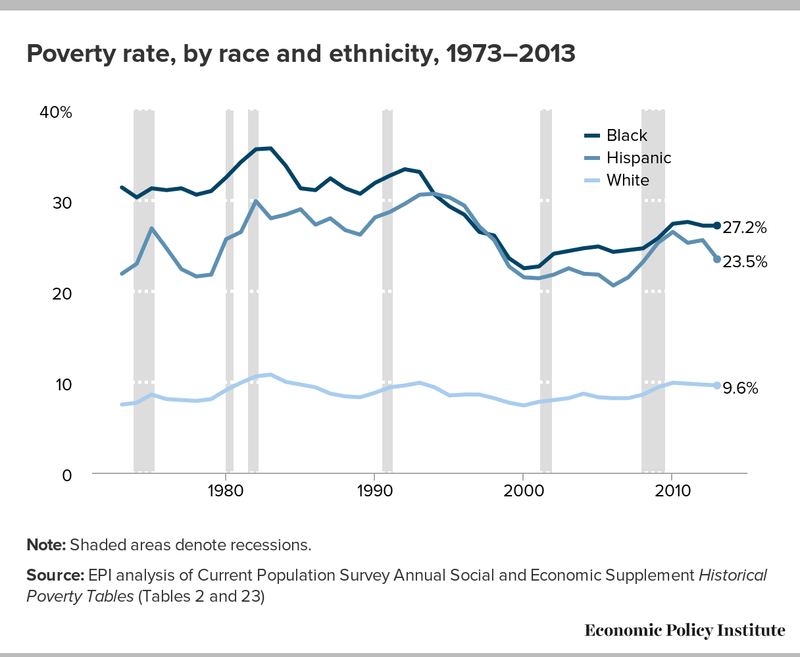 What is most striking about trends in the nonwhite population is the steep fall in poverty rates over the 1990s economic expansion. The declines in poverty among blacks and Hispanics in the mid- to late 1990s were due to a combination of macroeconomic factors, including high productivity, low unemployment, and the rising value of the minimum wage. The combination of these trends increased wages across the entire income distribution and lifted many out of poverty. This indicates that low unemployment and a growing economy are essential to increasing hours and wages at the bottom. Full employment is particularly critical to low-wage workers and to groups who have weaker ties to the labor market. In order to reduce poverty, and especially to correct it in the market via work and wages, it is crucial to pursue policies that will generate full employment (as will be discussed in greater depth later in this report). Given that many poor people work and that labor earnings account for an increasing share of income, it’s no surprise that wages at the bottom and the poverty rate are inversely related. 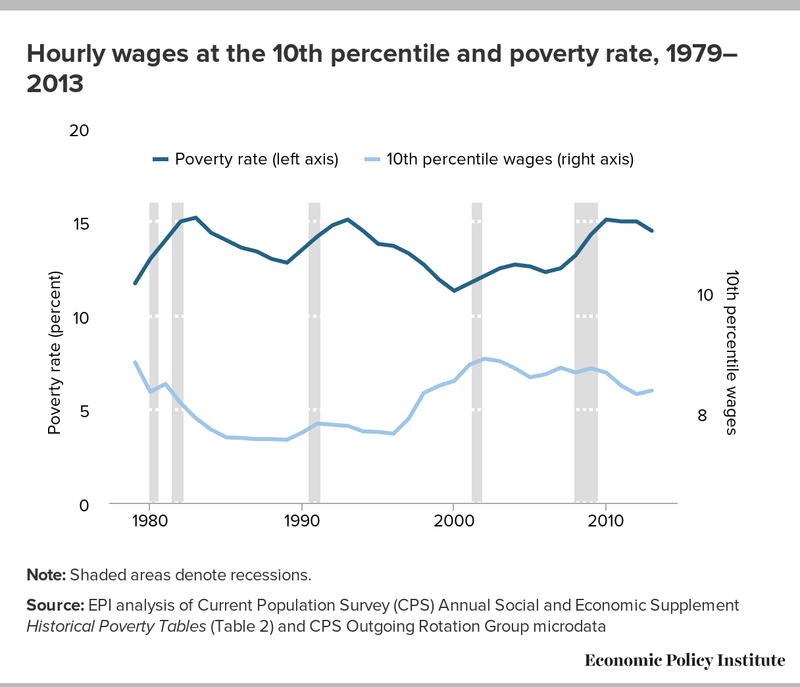 Figure H shows wages at the 10th percentile (i.e., the worker who earns more than only 10 percent of workers) from 1979 to 2013, compared with the share of people in poverty over the same time period. Over the majority of this period, as 10th percentile wages increased, poverty decreased, and as wages fell, the poverty rate rose. Although each measure has fluctuated modestly since 1979, the poverty level is now higher than in 1979, and the 10th percentile wage is slightly lower. In fact, for all but the highest earners, hourly wages have either stagnated or declined since 1979 (with the exception of a period of strong across-the-board wage growth in the late 1990s). Median hourly wages rose just 6.1 percent (or 0.2 percent annually) between 1979 and 2013, compared with a decline of 5.3 percent (or -0.2 percent annually) for the 10th percentile worker. Over the same period, the 95th percentile worker saw growth of 40.6 percent, for an annual gain of 1.0 percent (Bivens et al. 2014). 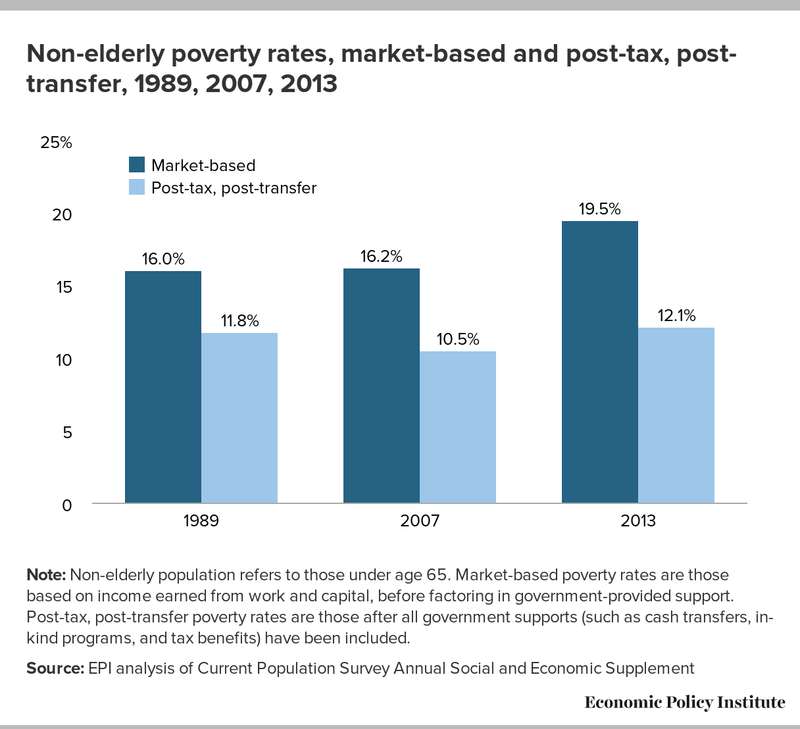 Figure I displays both market-based poverty rates (poverty rates based on income earned from work and capital, before factoring in government-provided support) and post-tax, post-transfer poverty rates (poverty rates once all government supports such as cash transfers, in-kind programs, and tax benefits have been included) for the non-elderly population (those under age 65). In 1989, market outcomes yielded a non-elderly poverty rate of 16.0 percent, but actual poverty, when counting tax-and-transfer programs, was lower, 11.8 percent, indicating the social safety net reduced poverty by 4.2 percentage points. About 20 years later, in 2007, the market produced slightly higher poverty (16.2 percent) among the non-elderly population (despite large increases in economy-wide productivity). In that year, the safety net lowered the non-elderly poverty rate even further, by 5.7 percentage points, to 10.5 percent. These data indicate, therefore, that the entire improvement (or, more than the entire improvement) in reducing observed non-elderly poverty from 11.8 percent in 1989 to 10.5 percent in 2007 was due to the safety net. This is true over 1967–2007 as well (Fox et al. 2013). Note: Non-elderly population refers to those under age 65. Market-based poverty rates are those based on income earned from work and capital, before factoring in government-provided support. Post-tax, post-transfer poverty rates are those after all government supports (such as cash transfers, in-kind programs, and tax benefits) have been included. As a result of the negative shock to employment, wages, and hours caused by the Great Recession, the market-based non-elderly poverty rate rose to 19.5 percent in 2013, substantially higher than in 1989. True to its purpose, the safety-net programs provided a countercyclical boost to incomes, absorbing much, though not all, of the upward pressure on poverty. Nevertheless, it is remarkable that economic outcomes generated a situation in 2013 where nearly one in five non-elderly households would have been poor if there were no government support, up from 16.2 percent in 2007. Overall, the safety net has produced significant progress toward reducing poverty, but the tax-and-transfer system needs to be complemented by a better labor market for low-wage workers. Without hourly wage gains and sufficient hours of work for the bottom fifth of households, the tax-and-transfer system needs to work harder simply to keep poverty rates from increasing. The clear connections among wages, incomes, and living standards mean that progress in alleviating poverty will be extraordinarily difficult without addressing wage growth. Indeed, converting the slow and unequal wage growth of the last three-and-a-half decades into broad-based wage growth is key to fighting poverty. To demonstrate wage growth’s effect on poverty, we simulate how poverty would have changed if wages had behaved differently over the 1979–2013 period. We look specifically at three common yardsticks for wage growth: average wage growth, productivity growth, and a full-employment economy. We use the wage distribution as it looked in 1979 and then apply these various conditions to wages through 2013. Then we calculate the new poverty rate for 2013, and identify the percentage-point change in poverty for each simulation. For all simulations we use market-based poverty in order to isolate how poverty is changed via market outcomes and before government intervention through taxes and transfers. We primarily present non-elderly (under 65) poverty rates and poverty rates for children, and perform analyses on the poverty rate by gender, race, and other factors. As discussed previously, wage growth was sluggish for the vast majority over the last three-and-a-half decades, yet wages increased dramatically for the top 1 percent, mirroring trends in incomes (Figure A). Figure J depicts these wage changes since 1979. It shows that the top 1 percent saw cumulative gains in annual wages of 137.7 percent between 1979 and 2013—over four times faster than average wage growth. 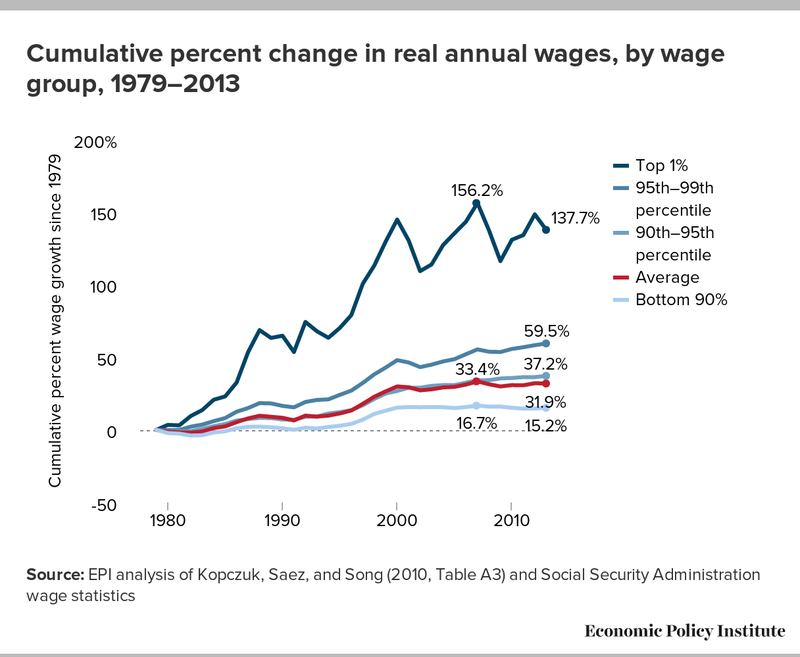 Comparing the growth of the top 1 percent with the wage growth of those between the 90th and 99th percentiles is also instructive. For example, wage earners in the 90th through 95th percentiles (earning more than 90 percent of other wage earners but less than the highest 5 percent) saw wage growth of 37.2 percent—more than double that of the bottom 90 percent of earners, but only about one-fourth as much as the wage gains of the top 1 percent. Wages at the bottom did not fare nearly as well. As we saw in Figure H, wages for the 10th percentile actually fell over this period. In fact, the entire bottom 90 percent’s wages grew just 15.2 percent, half the average growth rate, which was pulled up by much faster growth at the very top. But what would have happened if we had used wages as a tool for fighting poverty over the last three-and-a-half decades? What if everyone’s wages had stayed, in relation to everyone else’s wages, the same as in 1979? What if the level of inequality in 1979 had simply persisted, and inequality had not dramatically increased? Figure K shows how the shares of various demographic groups falling under the poverty thresholds would be lower had all wages grown at the rate of average wage growth (30.5 percent, according to the CPS ASEC) since 1979. Overall, the non-elderly market-based poverty rate would fall 8.6 percent, or 1.7 percentage points, bringing 4.5 million people out of poverty. The share of people who fall below 200 percent of the poverty threshold would decrease by 3.6 percentage points, or 9.5 million people. Among those age 18–64, women would see a slightly greater benefit from this higher wage growth: Their poverty rate would decrease by 1.5 percentage points (or 1.5 million women), while men’s would decrease by 1.3 points (or 1.2 million men). Children (those under age 18) would also disproportionately benefit, as they would experience a 2.4 percentage-point drop in their poverty rate, bringing 1.7 million children out of poverty. This simulation results in disparate impacts among different racial and ethnic groups. 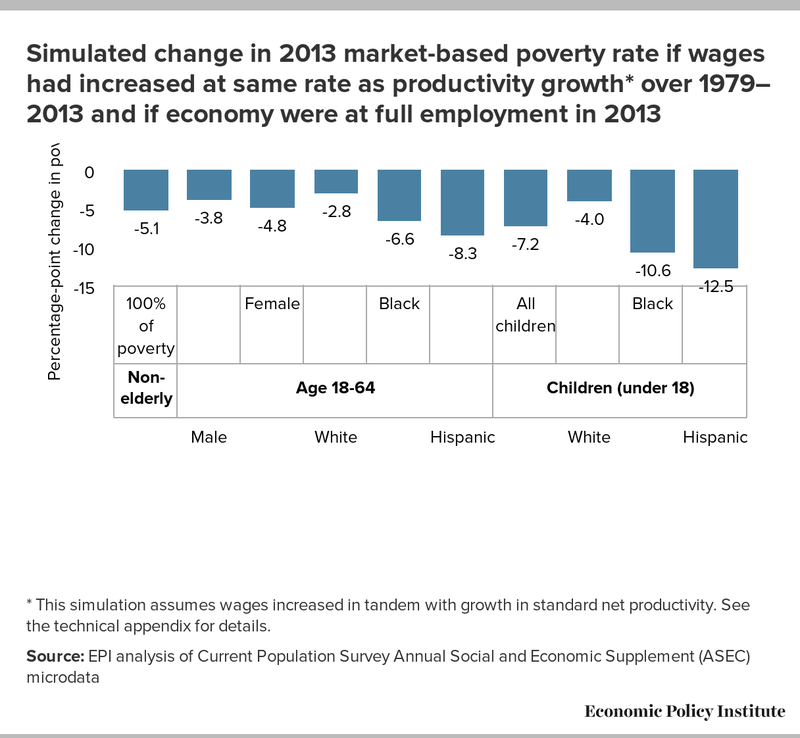 Blacks and Hispanics, who disproportionately comprise those in poverty (see Table 1), are also those who would most likely be lifted out of poverty by this broad-based wage growth. Figure L exhibits the drop in poverty for non-Hispanic white, non-Hispanic black, and Hispanic working-age and children populations. 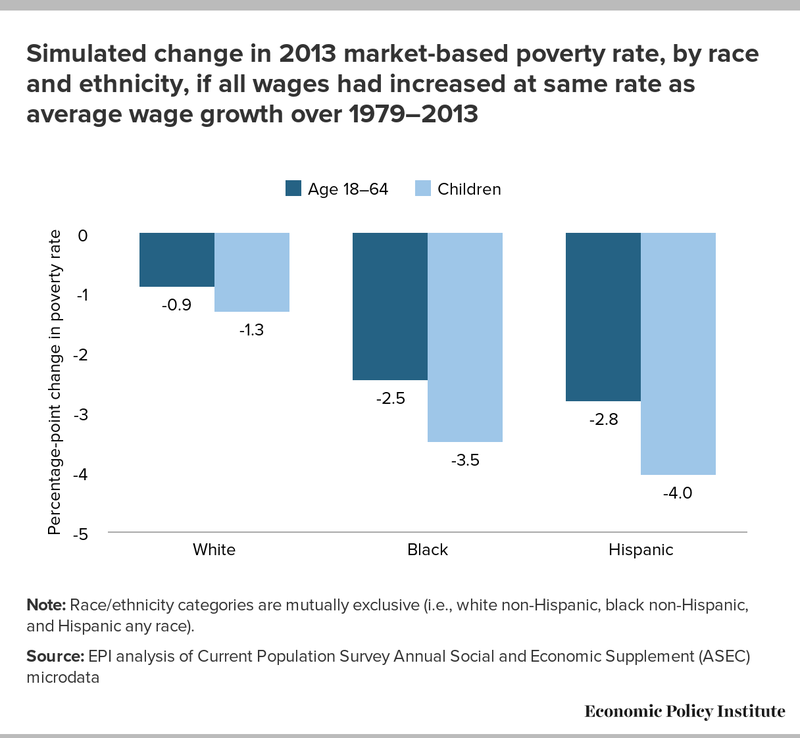 Among those of working age, market-based poverty rates would be 2.5 percentage points lower (584,000 people) for blacks and 2.8 percentage points lower (920,000 people) for Hispanics had all wages grown at the average rate, while whites would see only a 0.9 percentage-point decline. Again, we see even larger reductions for children, with their poverty rate reductions exceeding the working-age reduction by 42 to 49 percent across the different races and ethnicities. Since 1979, hourly pay for the vast majority of American workers has not only lagged behind growth at the very top of the distribution and thus behind average wage growth, but has also diverged from economy-wide productivity, as shown in Figure M. This divergence is at the root of numerous American economic challenges (Bivens et al. 2014). Note: Data are for compensation of production/nonsupervisory workers in the private sector and net productivity (growth of output of goods and services less depreciation per hour worked) of the total economy. Note: Hourly compensation is derived from inflating the average wages of production/nonsupervisory workers from the BLS Current Employment Statistics (CES) by a compensation-to-wage ratio. The compensation-to-wage ratio is calculated by dividing the average total compensation (wages and salaries plus benefits) by the average wage and salary accruals of all full- and part-time employees from the Bureau of Economic Analysis (BEA) National Income and Product Accounts (NIPA) interactive tables. Labor productivity is a measure of the value of goods and services produced in the economy in an average hour of work. It rises steadily over time (except possibly during some recessionary years) as technology, capital intensity, and the educational attainment of the U.S. workforce increase. When labor markets are tight and/or policy provides bargaining power to workers through labor market institutions such as a protected right to unionize and robust minimum wages, productivity increases usually generate corresponding wage increases. From 1948 to 1979, this combination of healthy labor markets and institutional support of workers’ bargaining power was sufficient to keep wage growth for the majority of U.S. workers tracking productivity growth. Over this period, net productivity (productivity after accounting for depreciation of capital) grew by 108.1 percent, and the compensation of nonsupervisory production workers (who comprise roughly 80 percent of the private-sector workforce) grew by a comparable 93.4 percent. Thus, the typical worker shared in the economic spoils of increased productivity. However, between 1979 and 2013, there was a marked decoupling of productivity and typical workers’ compensation. Over this span, productivity grew 63.5 percent, while hourly compensation of production and nonsupervisory workers grew just 7.7 percent. Productivity thus grew eight times faster than typical worker compensation, which means the prosperity created over this time period did not result in broad-based wage gains. We take another step to ensure consistency across the series of productivity and compensation by deflating net productivity by a consumption deflator to yield “usable” productivity (Baker and Rosnick 2007; to learn more about these productivity measures, see the productivity section of the technical appendix). While the growth in usable productivity is slightly closer to the growth in worker compensation, there still exists a substantial gap. 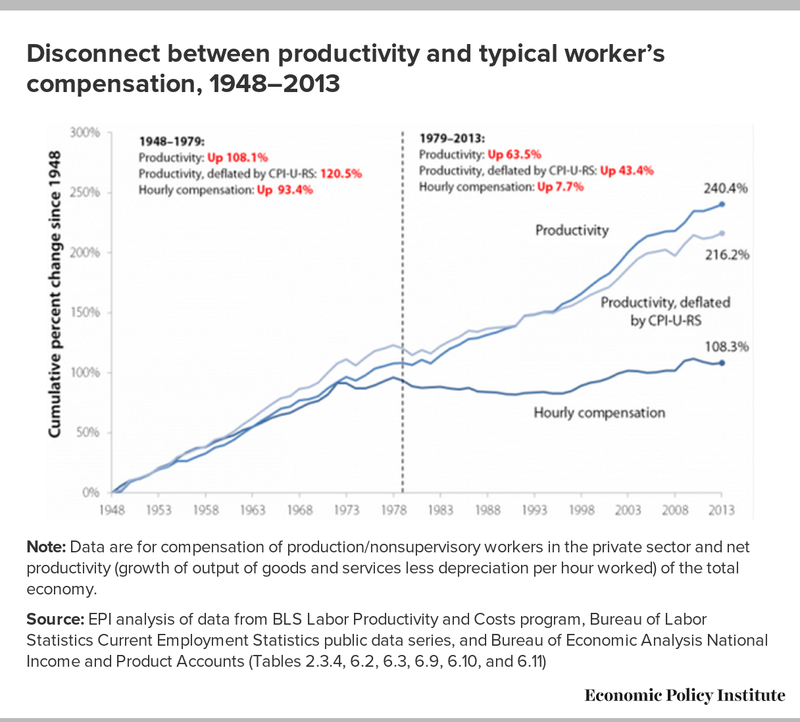 The growth in hourly compensation of 7.7 percent between 1979 and 2013 is still dwarfed by growth in usable productivity, which rose 43.4 percent. By this measure, productivity thus still grew more than five times faster than the typical worker’s compensation between 1979 and 2013. While many have claimed that the accumulation of overall wage growth at the top of the distribution in recent decades simply reflects a rising return to human capital, it is important to note that workers across the wage distribution have contributed to this increased productivity as well. 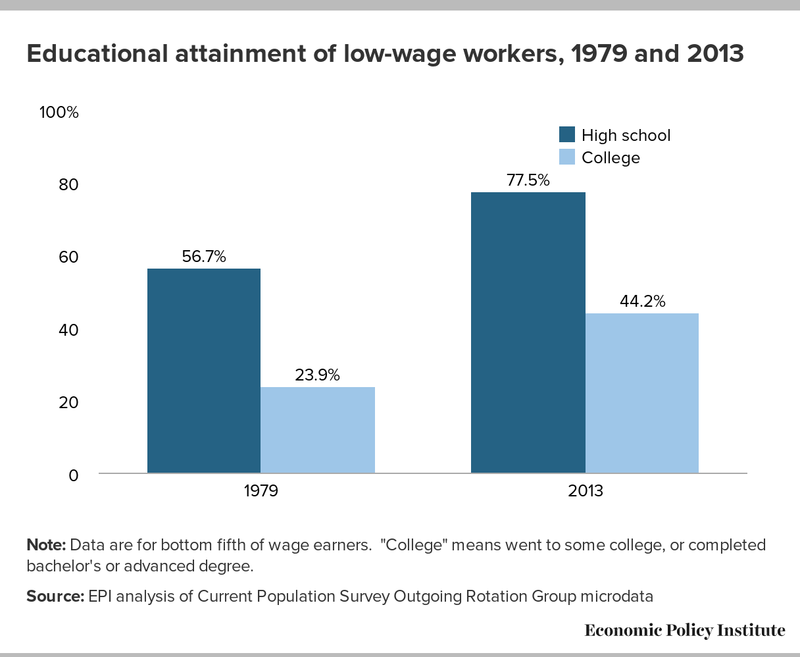 For instance, Figure N shows that low-wage workers have far more education now than in 1979, and therefore have a higher capacity for production. In 1979, only 56.7 percent of low-wage workers had a high school degree, compared with 77.5 percent in 2013. Correspondingly, many more low-wage workers have attended at least some college or have a college degree, which the graph identifies as “college.” While only 23.9 percent of low-wage workers in 1979 had some college experience or a college degree, that group had grown to 44.2 percent by 2013. Yet low-wage workers’ hourly wages have not improved much over this time. The next simulation examines what would have happened to low-income families if they had shared more of the gains of productivity via hourly wage growth. Note: Data are for bottom fifth of wage earners. "College" means went to some college, or completed bachelor's or advanced degree. Figures O and P show what happens to the poverty rate if wages had grown with productivity from 1979 to 2013. Compared with the average wage growth scenario (shown in Figures K and L), we see greater reductions at each poverty threshold and in each demographic group. This is not a surprise, as average wage growth was 30.5 percent, whereas our measure of usable productivity growth (as described in the technical appendix) was 43.4 percent; however, the patterns are similar. Furthermore, if the faster productivity growth measure were used, the resulting reductions in poverty would be even greater. Note: The simulation assumes that wages increased in tandem with growth in "usable" productivity. See the technical appendix for details. If wages had grown in tandem with productivity, the non-elderly market-based poverty rate would be 2.6 percentage points lower, and 7.1 million fewer people would be in poverty. The share of the non-elderly population below 200 percent of the poverty threshold would be 6.2 percentage points lower, representing 16.7 million people. Workers age 18–64 would experience a 2.3 percentage-point drop in their poverty rate, which is 0.9 percentage points greater than the reduction resulting from the average wage growth simulation. While this change seems relatively modest, it reflects the already low poverty rates for workers; the 2.3 percentage-point decline means a 26 percent reduction in the poverty rate for workers, meaning 3.1 million fewer people would be poor. Children again disproportionately benefit from broad-based wage growth, as they would see their poverty rate drop by 3.7 percentage points—and when at least one of their parents is working, it would drop 4.0 percentage points. This means that 2.7 million children would be brought out of poverty, 2.5 million of whom have at least one working parent. Women age 18–64 would see their poverty rate drop by 2.5 percentage points (2.5 million women) if they had experienced wage gains in line with productivity growth. Men age 18–64 would see a drop of 2.0 percentage points, representing 1.9 million men. If wages across-the-board had tracked productivity, marginalized groups such as the black or Hispanic populations would have experienced substantial gains. As evidenced by Figure P, black and Hispanic individuals age 18–64 would see larger-than-average drops in their market poverty rates of 3.6 and 4.3 percentage points, respectively. This means 864,000 blacks and 1.4 million Hispanics would be brought out of poverty if wages had grown with productivity. Overall, whites would see a reduction of 1.5 percentage points. Compared with whites, the black and Hispanic populations saw declines 2.5 and 2.9 times greater, respectively. Note: Race/ethnicity categories are mutually exclusive (i.e., white non-Hispanic, black non-Hispanic, and Hispanic any race). 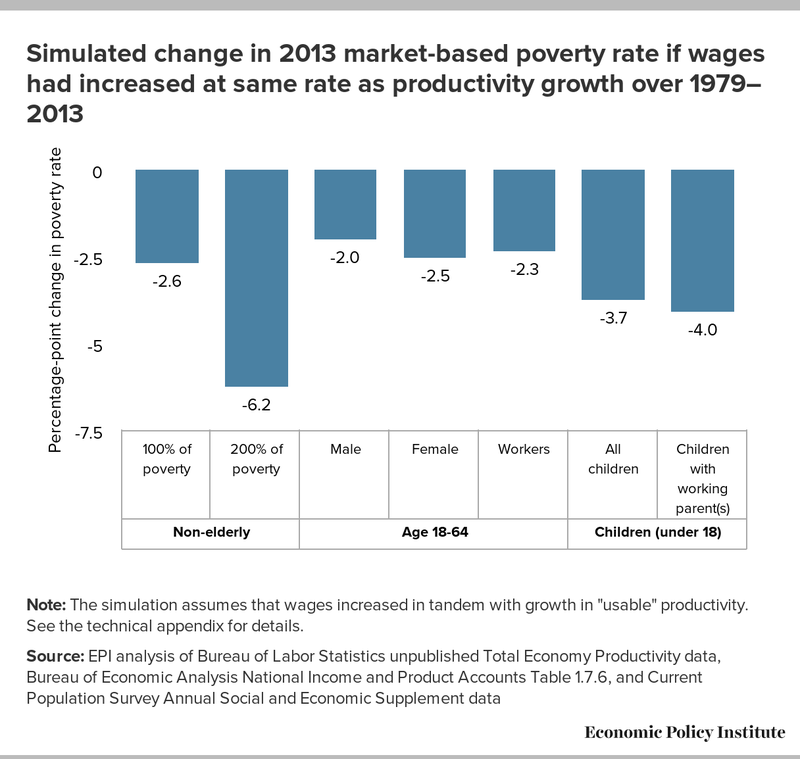 The simulation assumes that wages increased in tandem with growth in "usable" productivity. See the technical appendix for details. Black and Hispanic children again would see percentage-point decreases greater than those of white children. However, the starting points for each of these groups vary widely; the current market-based poverty rate for white children is 13.1 percent, compared with 43.1 percent for black children and 33.4 percent for Hispanic children. The 2.1 percentage-point drop for white children translates to a 16.2 percent decrease in their poverty rate. In comparison, the 5.0 percentage-point decline in the poverty rate of black children (which would bring 498,000 black children out of poverty) yields only an 11.5 percent drop in poverty. Hispanic children’s 6.5 percentage-point decrease translates to a decline in their poverty rate of nearly a fifth (representing 1.2 million Hispanic children). One market-based phenomenon that has generated broad-based wage growth is full employment. Full employment, or “the level of employment at which additional demand in the economy will not create more employment,” happens when there is high demand for workers, and virtually all who are willing and able to work are employed (Bernstein and Baker 2013). During a period of full employment, the unemployment rate is low, as more people who would otherwise be unemployed in a slack labor market gain employment. Due to high demand for labor, employed workers have more bargaining power; they will often be able to work when and for as many hours as they want and are generally able to negotiate higher wages. As discussed previously, full employment has a disproportionate impact on people in poverty and on the low-wage labor market. In Table 3 we saw that the average hours worked of those in poverty have varied much more than hours of those who are not in poverty, particularly since 2000. Average annual hours for those in poverty declined by 15.4 percent between 2000 and 2013, whereas those not in poverty only saw their hours decline 2.7 percent. In Table 2 we saw that wages and hours for all, but especially the bottom fifth, increased during a period of full employment (1995–2000). And in Figure F, we saw how periods of lower unemployment disproportionately boost wages at the bottom. As a result, like broad-based wage growth, full employment provides a substantial boost to those marginalized groups who are more likely to be in poverty. We simulate a healthy labor market by increasing annual work hours to match the levels found in the most recent year considered to have full employment (2000), and we combine this with wage growth equal to productivity growth for the entire wage distribution. In order to execute this simulation, we increase individuals’ work hours in 2013 by the percentage by which average work hours differed in the year 2000. In 2000, the official unemployment rate reached 4.0 percent. Wages had been rising across the entire wage distribution since 1995. Firms went to extraordinary lengths to attract and retain workers, such as chartering buses and offering in-house child care for even lower-paying occupations (Bernstein and Baker 2013, 26). Comparing the average annual hours worked in 2013 with hours worked in 2000, we estimate that the employable poor (see Table 3) worked 18.3 percent more hours on average in 2000 (for a more detailed explanation of this procedure, see the “Full employment” section of the technical appendix). In order to fully see the effect of both a tighter labor market and more broadly shared prosperity, we create a hybrid simulation that combines our productivity and full-employment simulations. We combine the boost in hours worked from full employment with the increase in hourly wages from the earlier productivity exercise. The results, seen in Figure Q, are broken down by various demographic groups to show the full impact of these combined forces. 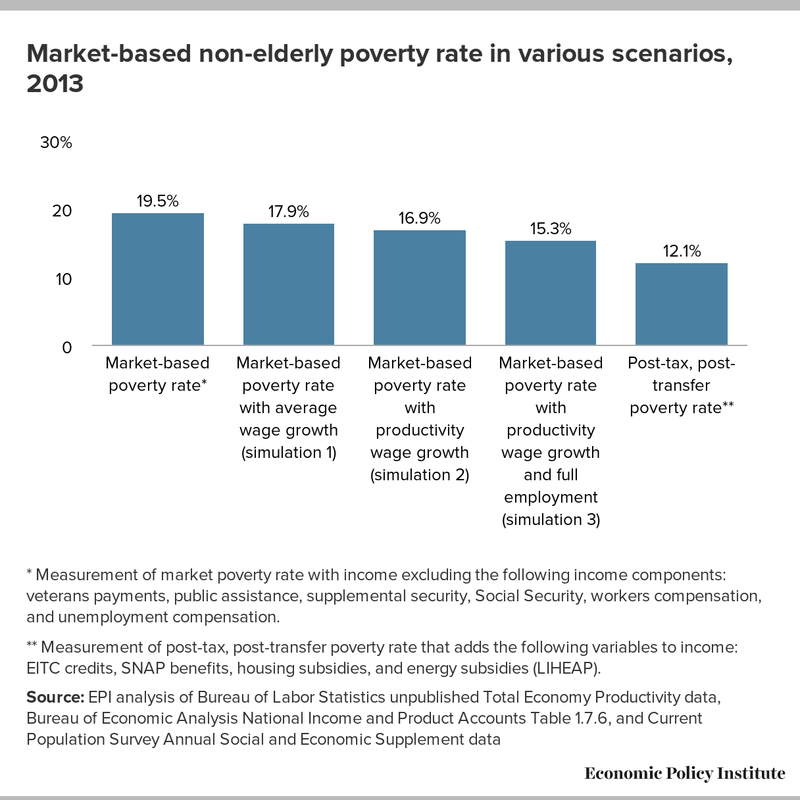 The overall non-elderly market-based poverty rate falls significantly with the addition of a full-employment simulation, as seen in Figure Q. Compared with the productivity growth simulation, which reduced poverty by 2.6 percentage points, the non-elderly poverty rate would decline by an extra 1.5 percentage points (a total of 4.2 percentage points, or 11.2 million people) if we were also at full employment. If we had used the net productivity rate (as shown in Appendix Figure A1), the non-elderly poverty rate would be reduced by 5.1 percentage points (or 13.7 million people). In addition, we see that when workers’ wages increase with productivity and those at the bottom of the distribution are able to benefit from full employment, the most marginalized economic groups benefit most. Women age 18–64 benefit more from the collective boost in wages and hours than men age 18–64, seeing a reduction in their poverty rate of 3.9 percentage points (or 3.9 million women), compared with 3.1 percentage points for men (or 3.0 million men). In percentage terms though, these drops are very similar, as women are more likely to be in poverty; 20.1 percent of women are in poverty, as compared with 16.5 percent of men (in market-based terms). 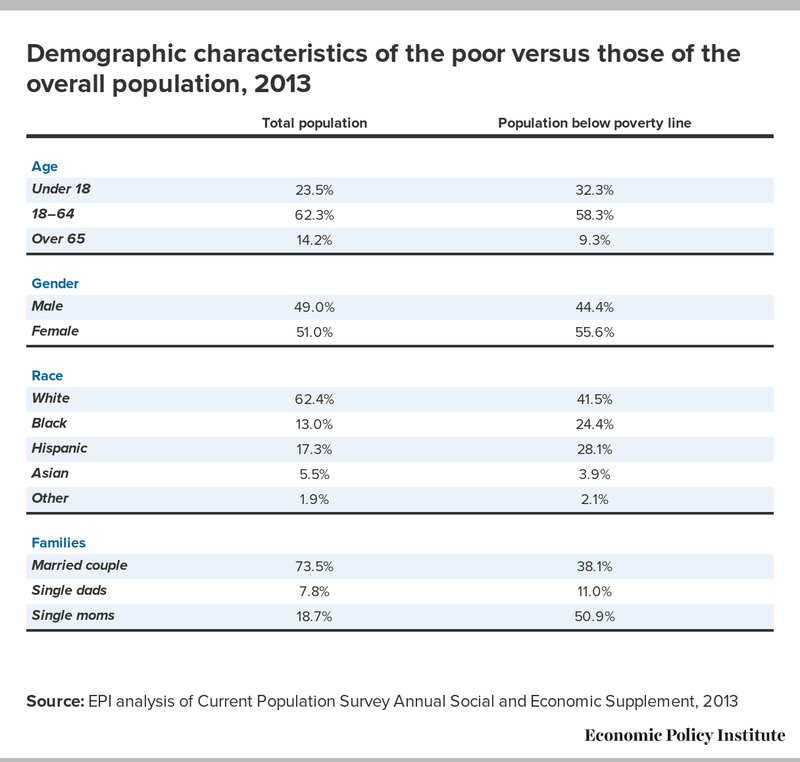 While the market-based poverty rate for whites age 18–64 falls 2.4 percentage points (16.2 percent, or 2.9 million people), blacks age 18–64 and Hispanics age 18–64 see far greater reductions of 5.4 percentage points (17.6 percent, or 1.3 million people) and 6.7 percentage points (28.0 percent, or 2.2 million people), respectively. The differences between the market-based poverty rates of white children versus black and Hispanic children are much more pronounced. As previously noted, before any kind of government transfers, 13.1 percent of white children are below the poverty line, versus 43.1 percent of black children and 33.4 percent of Hispanic children. White children experience a 3.4 percentage-point (25.8 percent) decline, compared with declines of 8.3 percentage points (19.3 percent) for black children and 10.3 percentage points (30.8 percent) for Hispanic children. If we had both targeted full employment and seen wage growth more consistent with productivity, the number of children in poverty would fall by 1.3 million for white children, 839,000 for black children, and 1.8 million for Hispanic children. 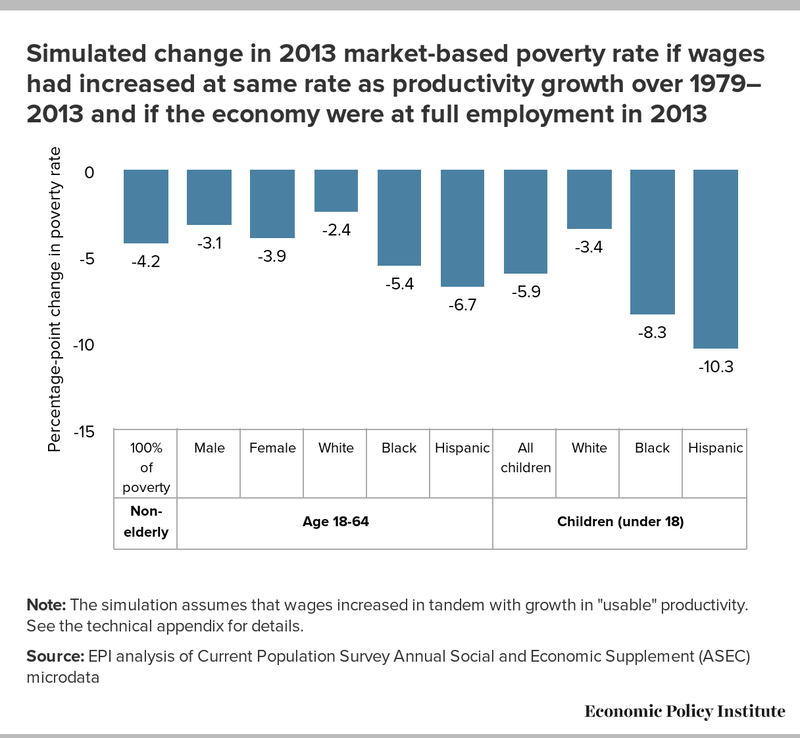 A summary of these simulations, seen in Figure R, demonstrates that broad-based wage growth and targeting full employment are both potent tools for reducing poverty. Yet, policy levers that would contribute to these market-based objectives have been mostly absent since 1979, sometimes by commission and sometimes by omission of policymakers. As a result, the safety net has to work much harder now to keep poverty down. The following section discusses policy options for targeting strong wage growth that can achieve these real gains for lower-income individuals and families, lifting many out of poverty and simultaneously supporting the safety-net system. * Measurement of market poverty rate with income excluding the following income components: veterans payments, public assistance, supplemental security, Social Security, workers compensation, and unemployment compensation. ** Measurement of post-tax, post-transfer poverty rate that adds the following variables to income: EITC credits, SNAP benefits, housing subsidies, and energy subsidies (LIHEAP). That the poverty rate has remained stubbornly elevated over the last three-and-a-half decades is simply a symptom of an increasingly unequal economy, marked by nearly stagnant hourly wages for the vast majority of the American workforce. The elevated poverty rates we have seen since the 1980s are not the sad outcome of inevitable and irreversible changes in the economy, but of policy choices that have weakened the position of low- and moderate-wage workers while putting more leverage in the hands of those with the most economic power. Despite the importance of expanding the tax-and-transfer system to reduce poverty and boost incomes for low- and moderate-income Americans, if nothing is done to change the policies that have led to elevated unemployment and increasing wage inequality, income inequality and poverty will continue rising. This logically flows from the fact that if increased inequality continues to suppress hourly wage growth for the low-wage workforce, we will need more tax credits and more transfers each year to simply keep after-tax income inequality stable—let alone reversing the upward income and wage redistribution of recent decades. As seen in Figure I, without the tax-and-transfer system, the poverty rate would be markedly higher. As market-based poverty has steadily grown since 1989, the tax-and-transfer system has had to work even harder to keep poverty down. If we were to utilize the full range of policy tools at our disposal, including encouraging broad-based wage growth, the safety net would be greatly supported. This is especially true in a post–Great Recession economy. In 2013, the market-based poverty rate was 19.5 percent, yet the safety net brought that down 7.4 percentage points, to 12.1 percent. 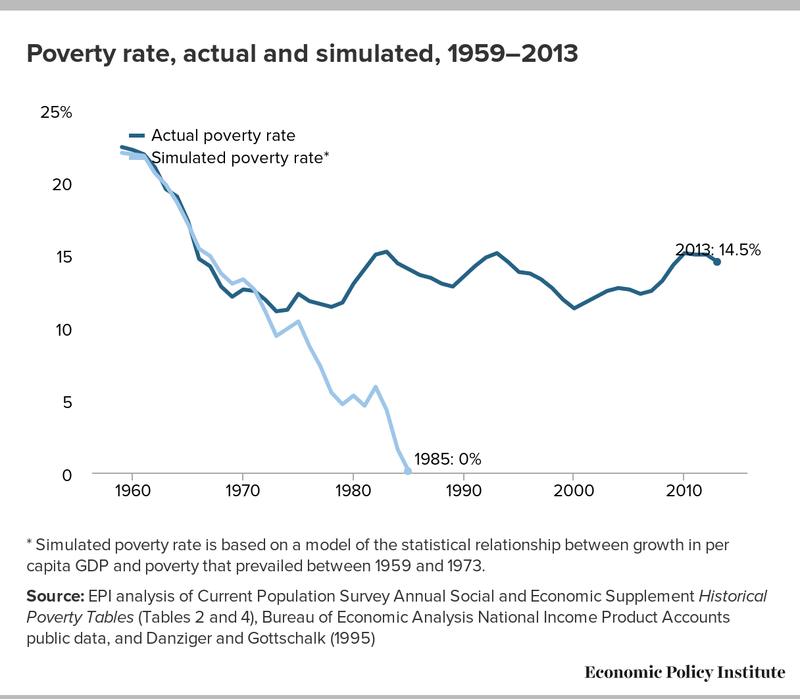 As our final simulation demonstrates, if the economy were at full employment and if wage gains had tracked productivity over 1979–2013, the market-based poverty rate would be 4.2 percentage points lower. In other words, using full employment and broad-based wage growth as tools to reduce poverty could yield an impact on poverty reduction that is more than half as large as that of the entire range of our current anti-poverty programs. Additionally, broad-based wage growth and a tighter labor market would help to reduce the poverty gap, or the average distance between a poor person’s income and the poverty threshold. If the poor were simply given enough money to reach their respective poverty thresholds (starting at their market incomes as a base), it would take $396.7 billion. We calculate that wage growth and full employment would reduce the safety net’s burden by 7.6 percent, or $30.1 billion, in its ultimate goal of raising the entire impoverished population above the poverty line. For further explanation of the actions we can take to raise wages and reduce poverty, see EPI’s Agenda to Raise America’s Pay. Alyssa Davis joined EPI in 2013 as the Bernard and Audre Rapoport Fellow. She assists EPI’s researchers in their ongoing analysis of the labor force, labor standards, and other aspects of the economy. Alyssa aids in the design and execution of research projects in areas such as poverty, education, health care, and immigration. She also works with the Economic Analysis and Research Network (EARN) to provide research support to various state advocacy organizations. Alyssa has previously worked in the Texas House of Representatives and the U.S. Senate. She holds a B.A. from the University of Texas at Austin. Wages are measured using data from the Current Population Survey’s Annual Social and Economic Supplement (ASEC). The Census Bureau uses the ASEC to calculate poverty rates because the survey constructs a hierarchical relationship between an individual, his or her family unit, and his or her household. The poverty rate is a family concept, meaning that one’s poverty status depends on the family income, not individual income (except for families of one). Besides allowing us to measure wages, the ASEC also provides variables that measure other nonwage components of income such as cash transfers (Social Security, workers compensation, unemployment compensation, etc.) and in-kind transfers (SNAP, rent assistance, etc.). These allow us to construct different incomes besides that which is used for the official poverty rate. We use unpublished total economy productivity data from the Bureau of Labor Statistics Labor Productivity and Costs program to calculate productivity growth. Total economy productivity measures the output per hour of the total economy, including private and public sectors. We also employ data from Table 1.7.6 of the Bureau of Economic Analysis National Income and Product Accounts tables in order to generate an estimate of the amount of capital depreciation that occurs over time, which acts as a deflator of the productivity growth series that we use. In constructing the sample to calculate the wage ventiles, we include wage earners who are age 18 and older, and who worked in the public or private sector (unincorporated self-employed workers were excluded). Lower and upper bounds were set to exclude outliers. The bounds on hourly wages were set to 50 cents and $100 in 1989 dollars, adjusted for inflation by the CPI-U-X1 (and then CPI-U-RS when the CPI-U-X1 stopped in 2001). For 2013, the lower bound was $0.93 and the upper bound was $181.39. This procedure excluded 396 observations, or 0.6 percent of the sample. Unlike Fox et al., however, we stick to the income thresholds that determine the official poverty rate rather than using the Supplemental Poverty Measure (SPM) thresholds. We do differ from Fox et al. on this calculation because we do not include the value of school-provided lunches due to concerns about data reliability. The productivity series measures total economy productivity, not just the commonly cited nonfarm business sector productivity measure. This total economy measure is better for assessing the U.S. economy’s capacity to generate average wage increases. Second, both productivity measures account for depreciation of capital (wearing down of machinery, land, and non-labor inputs); they are net measures of productivity. This similarly provides a better measure of the economy’s capacity to generate real wage growth—and as a larger share of the nation’s capital stock over time is constituted of fast-depreciating goods such as software, this is an extremely important adjustment to make. In order to estimate the extent to which depreciation occurs, we calculate the ratio of net domestic product to gross domestic product, available in the Bureau of Economic Analysis National Income and Product Accounts tables (NIPA Table 1.7.6). This ratio is always less than one, and the difference between one and this ratio reflects the amount of depreciation that occurs in the economy for capital goods. Finally, the usable productivity is deflated by consumer prices. Comparing productivity to compensation over time can be difficult, as they reflect different accounts and are consequentially adjusted by different price indices. Productivity is measured from output and thus utilizes an output price deflator (which reflects prices of all components in the GDP makeup: investment, consumption, government spending, and net exports) rather than a consumption deflator, such as a price index for consumer goods, as is used for the compensation series. In recent decades, consumer prices have increased faster than output prices. 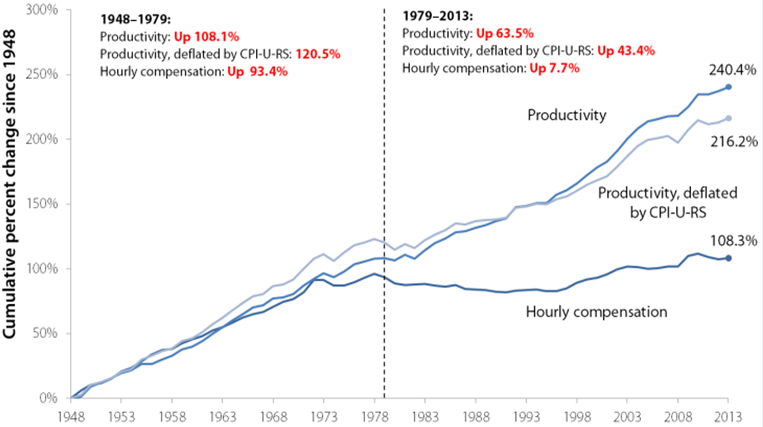 Because of this, the wedge that increased earnestly after the 1970s between the productivity growth and the compensation measures seen in Figure M reflects both a failure of productivity gains to be directed to the majority of American workers through higher compensation (i.e., rising inequality), as well as a failure of productivity gains to translate into higher living standards via lower prices for consumers. While both of these outcomes reflect profound failures of the U.S. economy, in our simulation we want to isolate the influence of inequality on wages. To do this, we deflate both the compensation and productivity series by the same price deflator. This provides a very conservative measure of how much the failure of productivity to spur wage growth has harmed typical American workers, because it only examines one channel of this failure. In order to produce the usable productivity series, we deflate the nominal output data using the same deflator as we do for wages, which is the BLS Consumer Price Index Research Series Using Current Methods (CPI-U-RS). Because the CPI-U-RS reflects only prices that consumers face, deflating productivity by the CPI-U-RS (versus a GDP deflator, which also includes prices of investments, exports, and government goods) should also more accurately reflect the potential translation into greater compensation for workers. First, we deflate nominal output by the CPI-U-RS to generate an index of the real output of the economy that is weighted by consumer price changes rather than output price changes. Real output is then divided by the hours worked of all persons, which yields the real output per hours of all persons, or alternative productivity. The purpose of our research was to predict what wages could have been in 2013 had certain assumptions played out since 1979 in order to estimate the resulting poverty rates. One cannot simply multiply one’s wage in 2013 by the growth multipliers we use because if we imagine we’re doing this for an individual, we have to know what she made in 1979. In order to estimate how much any one person made in 1979, we calculated where that person falls in the wage distribution currently (2013) and then find what a person made at that approximate point in the wage distribution in 1979. We calculate the average hourly wage growth as the growth in the hours-weighted average wage from 1979 to 2013. Although the ASEC only provides an annual wage response, an hourly wage can be constructed by dividing the annual wage by the product of the typical weeks worked and typical number of hours per week worked last year by the respondent. The hours weight was constructed by multiplying the standard ASEC person weight by the number of hours worked by that person. The purpose of using the hours-weighted average versus the standard person-weighted average is to ensure that the wages of those people who worked more were appropriately reflected in the average. The hours-weighted average wage growth between 1979 and 2013 was 30.5 percent. where pd equals the wage at each 1979 percentile multiplied by the growth multiplier, m.
where hrwg equals the individual’s actual hourly wage in 2013. The additional hourly wage is then multiplied by the product of typical weeks worked and the typical hours per week worked in the previous year in order to get an annual potential additional wage income. Now, we can incorporate this additional income into a family’s overall income to calculate the simulated poverty rates. To most accurately reflect the increase in work hours experienced by those in poverty during a time of full employment, we compare the average annual hours worked by “employable” people in poverty (age 18–64) from 2000 to 2013. Employable people are defined as those who either work (earning positive wages) or had reasons for not working other than being disabled, in school, or retired (this basically leaves those who are taking care of the home/family, are in the armed forces, were unable to find work, or who were not working for other reasons). In 2000, those in poverty who were employable worked 872 hours annually, on average. Those in poverty who do work are also more likely to have more precarious, part-time employment that simply doesn’t provide them with many hours of work. In 2013, however, the labor market was far from full employment; consequently, these average annual hours are much lower, at 737. The ratio of the annual average hours worked in 2000 to 2013 was therefore 1.183. This suggests that if the labor market were as close to full employment in 2013 as it was in 2000, the employable poor would be working 18.3 percent more on average. We simply multiply people’s work hours by the ratio of 1.183 and include this additional wage income in individuals’ overall incomes. Alternatively to the usable productivity multiplier that we used in this paper’s simulations, we could also employ the standard net productivity measure to imagine an ever stronger possibility for wage growth. Because the net productivity series is still deflated with an output deflator, using it as a multiplier for workers’ wages essentially projects the scenario in which their increased productivity is rewarded in the form of greater compensation and cheaper products. Appendix Figure A1 shows the results of the simulation using the standard net productivity and assuming a full employment economy (similar to Figure Q). This simulation would further reduce poverty across the board. Namely, non-elderly poverty would be 5.1 percentage points (or 26.1 percent) lower, bringing 13.7 million people out of poverty. * This simulation assumes wages increased in tandem with growth in standard net productivity. See the technical appendix for details. 1. In particular, the stock market decline led to very large reductions in top 1 percent incomes in 2007–2009, as large shares of these incomes are related to asset prices. However, Piketty and Saez (2014) data show that these top 1 percent incomes have almost recovered since the Great Recession. Bernstein, Jared, and Dean Baker. 2013. Getting Back to Full Employment: A Better Bargain for Working People. Washington, D.C.: Center for Economic and Policy Research. Danziger, Sheldon, and Peter Gottschalk. 1995. America Unequal. New York: Russell Sage Foundation; Cambridge, Mass. : Harvard University Press.